North Adams, MA was officially named after Samuel Adams, a leader in the American Revolution, signer of the Declaration of independence and governor of Massachusetts. The Berkshire county city incorporated in 1878 after separating from the town of Adams. The city’s position on the Hoosic River made it ideal for many industries, because of the abundant water power that was available. 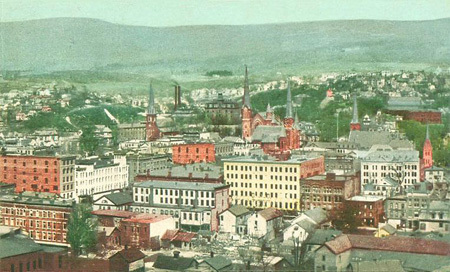 From before the Revolutionary War to the mid-1980’s North Adams, MA was a booming industrial city, but with the competition from abroad the city’s industries were not able to maintain themselves. Today, North Adams is undergoing a rebirth as a cultural destination. The closure of the Sprague Electric Company in the 1980’s left a large facility vacant. Political leaders almost immediately started looking for alternative uses for the facility. Today, it is home of MASS MoCA, Massachusetts Museum of Contemporary Art. North Adams, MA has arts and entertainment as well as outdoor recreation like Natural Bridge State park, where you can see what thousands of years of water erosion has done to marble. Least populated city in the state of MA.